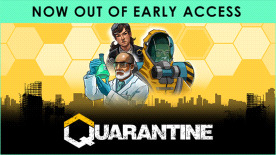 Quarantine is an intense turn-based strategy game about waging war on global disease. As the director of Pandemic Defence, an international biosecurity agency, you must respond to the onslaught of widespread, deadly contagions. A new pathogen has arrived and every turn counts—our survival rests in your hands. Recruit a team of specialized operatives and deploy them on high-stakes missions across the globe. Research the disease, upgrade your tech, and quarantine the outbreak before it infects—and kills—us all. Find the cure. Save the world. Win the war on disease with the ultimate survival game! • Immersive Graphics & Authentic Setting - Inspired by real-world science and epidemic response, experience the tough choices and nail-biting suspense in this modern fight for humanity. • Expand your reach. Set up field bases and raise crucial funding. Don't let cities fall into chaos: the livelihood of your organization —and the world— depends on it. • Advance your tech. Unlock upgrades and new operations on the diverse tech tree to adapt your strategy and refine your play style. • Hit the lab. Collect biological samples from hotspots to research the disease's randomly generated traits. Use the results to turn the tide and find the cure. • Hours of Replayability - Increase your resistance with easy challenges so you can endure Nature's worst. Three difficulty modes, four leaders, a variety of starting locations, and unpredictable gameplay ensure that no two games are the same. ©505 Games 2017. All rights reserved. Developed by Sproing. Published by 505 Games. 505 Games, Quarantine and the 505 Games and Quarantine logos are trademarks and/or registered trademarks of 505 Games S.p.A. throughout the world.